Although the stimulating properties of coffee are thought to have been discovered in Africa – according to legend, by an Ethiopian goatherd – the consumption of the beverage is not as widespread in the continent as it is elsewhere in the world. That has been a major problem for Africa’s champion barista Roberts Mbabazi from Uganda, a nation of tea-drinkers, which is one of the world’s biggest producers of Robusta beans. “Ugandans don’t really drink coffee. That has been my biggest challenge. Someone will ask you: ‘Why coffee? Why can’t I take tea? Why can’t I take a soda or a mineral water,” he told the BBC’s series African Dream. But he is hoping that will change as Uganda’s middle class continues to expand – according to the African Development Bank, it already represents around 20% of its population. “We are getting people who are travelling, who are coming back from the US or from the UK, and they see how coffee can be enjoyed, they see the culture – and I believe if I keep pushing on we’ll break the barrier,” he said. So what does a coffee consultant do? How does he make his money? “If you come up with a coffee problem, I’ll troubleshoot it; I’ll fix it for you,” he explained to the BBC’s Catherine Byaruhanga. “You want to open up a coffee shop, you call Robert. I’ll come and help you. I’ll conceptualise all your ideas. I’ll bring them to life. “If you are a young kid and you want to get some practical skills, I’ll train you as a barista so that you can get something to do with your life. “If you are a famer and you want to promote quality, you want to have a quality produce, you call me in and I’ll advise you on how to pick your coffee, how to dry it, how to process it,” he continued. The 26-year-old entrepreneur added that he can also provide factories with a professional assessment of the quality of their coffee. Mr Mbabazi started his company, Barista Pro Coffee, in 2010. According to the Oxford English Dictionary, barista is a word of Italian origin that refers to a “person who makes and serves coffee in a coffee bar”. But, for people in the industry, it also denotes real expertise. Good baristas are expected to know in detail the process of coffee-making from cultivation and harvesting to roasting, blending and brewing. “The most inspirational story I have is my first visit to the coffee farms, when I actually stepped foot on the coffee farms and saw how hard work the farmers were going through, I really got inspired. “I couldn’t believe that such a small crop could actually be taken care of by a group of organised farmers through so many processes. That alone made me fall in love with the whole product,” he remembers. The coffee bug bit Mr Mbabazi shortly after he finished secondary school, in 2004. Coming from a poor family, he realised that he would not be able to raise funds to pay for university fees and decided to look for a job. He first worked as a shopkeeper but, as the pay was too low, moved on and tried his luck as a waiter in different restaurants, clubs and bars. In one of those bars, at the central Speke Hotel in Kampala, Uganda’s capital, he learned how to brew coffee. It was then, he says, that he became aware of the irony that in a country which grows so much coffee, people do not normally drink it. 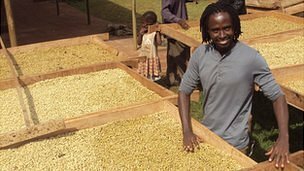 In late 2006 he started to work at Kampala Ballet and Modern Dance School’s new cafe and the following year joined a barista training course held by the Uganda Coffee Development Authority. He went on to win Uganda’s National Barista Championship three times, and represented his country in several international competitions for which he received further training, in places like Canada and the Netherlands. In 2012 he competed in Ethiopia and became Africa’s Barista Challenge Champion. Mr Mbabazi told BBC Africa that he spent around $7,000 (£4,300) to set up his company. A significant part of that money was used to buy espresso machines and other equipment. “Before then, all I had to invest was time. I really had to spend a lot of time away from my family; I had to spend a lot of time travelling to the US, to Canada, to Switzerland, always studying about coffee,” the entrepreneur said. He explained that he managed to save his starting capital from his previous jobs. At the moment, he is earning about $2,000 a month. According to the Uganda Bureau of Statistics, the average monthly household income is of around $112 nationally and $355 in Kampala. “When you take off the taxes, I can go on a net of something like $1,200 a month and for a young guy like me that’s a very good figure to start with,” he said. His company also employs four other people: two sales executives, one financial controller and one quality controller. “I believe that I’ll still realise my dream of going back to school, do something fun, but for now I’m enjoying coffee, I’m passionate about coffee and I don’t mind spending the little money I have in coffee,” he said. Mr Mbabazi also seems to be passionate about teaching others what he has learned in the coffee industry. “I see myself heading towards setting up my own coffee academy. I want to have a facility where I can bring in kids, train them through the necessary steps that coffee goes through, train them through the necessary quality parameters that you must always apply while dealing with coffee, train them with some barista skills,” he explained. “I just want to see that this country can realise that the youth have the potential to drive the coffee economy towards the right direction, and that’s my ultimate goal,” the young entrepreneur added.